Bloodlines brings us a lot of fun characters. A few we know from the VA series: Sydney, Jill, Eddie, Adrian. Oh Adrian. I felt so very bad for him at the end of Last Sacrifice. I really do like Adrian’s character, and I was curious to see what he would be like in the new series. As if I couldn’t have liked him enough before, I like him even more now. I really didn’t know what to expect from Sydney. She was a really uptight character in the VA series, so I didn’t really know if I would be able to connect with her very well. But I was able to, and I thought she was great as well. The storyline was really interesting and fast paced. Once I had a chance to sit down, I had the book finished in just a few hours time. The story kept me hooked and kept me guessing, although I had my suspicions, and they turned out to be right. Overall, I really enjoyed Bloodlines. I don’t know why I was worried that I wouldn’t. It was a really good read, and I can’t wait to read the next book, The Golden Lily! I still have to read VA. It's good that this book didn't disappoint! I get worried to, and it usually deters me from reading it. I am really glad to hear you liked it. I was a little worried myself till I read the first couple of chapters online. I will hopefully be getting my copy tomorrow. Nice review! 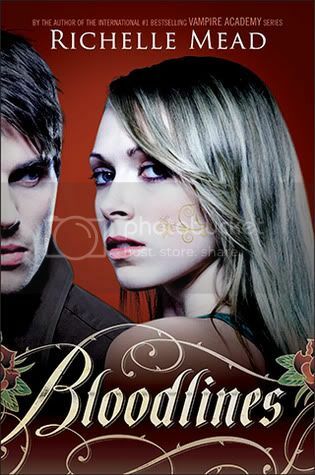 I've been a bit hesitant about reading Bloodlines even though VA is my favourite series. Adrian wasn't my fav character and neither was Sydney. But this review has sparked my interest. Thanks Cristy. AHH. That last line killed. Damn you, Richelle Mead! Great review! I really loved this. Adrian is just... man, I loved in VA but he smashed the awesome-o-meter in Bloodlines. I love him so much more <3 I really enjoyed Sydney's point of view. Totally different from Rose, yet an equally engaging character. Cannot wait for The Golden Lily! I am going to finish the Vampire Academy books before reading this, but your review has me really excited to jump in! I can't wait. I haven't met any of these characters yet, so I am looking forward to seeing these names pop up in the VA series. I am glad it lived up to your expectations and that you enjoyed it. Great review as always Christy! I've been worried it won't be as good as VA, but I'm less nervous now! Can't wait to read it, really interested in reading about Sydney. Great review! I'm really excited to go pick this one up tomorrow. I'm totally in love with Richelle Mead's world. Thanks for the review. I was worried this one couldn't possibly live up to VA either, glad to know that's unfounded and this story is equally good. Hopefully we'll get to see growth from Jill just like we did Lissa and Rose in VA. Thanks for the review Christy! I loved Vampire Academy and I can't wait to read this book too. I was heartbroken over Adrian too. Usually in love triangles I always have a distinct person in mind but it was harder with Dimitri and Adrian (I picked Dimitri only because I fell for him first). I'm really excited and hopeful for Adrian in this series. If Dimitri makes an appearance then this book will have been more than worth the wait. I would absolutely read a series about him, but I digress. I had some reservations about this series, too, but I'm glad that I pre-ordered it and am looking forward to getting to know Adrian and Sydney a bit better! I'm ready for some fast paced reads. Yay! Great review. *smacks forehead* I still haven't read VA. Which is awful, I know. Now I just need to make myself read it. Great review! !